The downtown darlings of improvisation return with a joyful noise, great songs, a jubilant shout. How about a second shout of joy in the jazz world? How about a laugh and tear, yup both, on a recording that also features world-class improvisation? A Radiohead cover that actually kills? Whaddaya say to some pop-star cameos that, amazingly, do not overshadow the band itself and, instead, just highlight how sublime the less-than-knowns are? What’s that I hear? You say “Yes”? Then the happy new recording by The Jazz Passengers is for you! Reunited is a nugget of gold for jazz fans—or for anyone who digs off-beat joy in music. The Jazz Passengers emerged in the wake of the Lounge Lizards (John Lurie’s “faux-jazz” group of the early 1980s)—founded by reed player Roy Nathanson and trombonist Curtis Fowlkes. It has been a round dozen years since the group recorded, with the players (including Bill Ware on vibes, Brad Jones on bass, drummer E.J. Rodriguez, and special guests like Marc Ribot on guitar, Deborah Harry and Elvis Costello on vocals) plenty busy on their own. In its heyday, the band combined Mingus-style hard bop with soulful vocals, all overlaid with a Marx Brothers theatrical sensibility. Nathanson and Fowlkes met playing in the pit band for the Big Apple Circus. Nathanson has a background in theater, and he has appeared in films by Jim Jarmusch and Elaine May. He is a soundtrack composer as well as a jazz guy, and in 2005 he composed a piece about the world’s oldest object, a four-billion year-old zircon and then had the Passengers perform it at a (do you see this coming?) “rock concert” in Wisconsin. So, it is literally fun to have a new recording from Nathanson and Co. And jazz—properly, I’m afraid, accused of being the most self-serious of American art forms—can always use some lightness. The Jazz Passengers are not, however, just yukking it up. The opening track, “Wind Walked By”, is a vocal feature for Elvis Costello’s insistent voice, a hard-luck tale with a beautiful melody and a lush jazz-ballad arrangement. Yet the sensitive melodrama of the tune is cracked open by the lurching chorus, Ribot’s jabbing string work, and a hip doo-wop out-chorus. It’s fun, slyly funny, but also moving and beautiful. What jazz bands have that range? A couple of tunes here are grooving for a good time. “Button Up” has a backbeat arrangement that might sound good on a George Clinton disc, with the band members handling the vocals themselves. Ware’s vibes solo manages to bring plenty of bop to the funk, however. “Tell Me” sets up a percolating Latin feel in 6/8, over which a breezy soul vocal can float before Fowlkes’ mellow trombone solo takes over. The goofiness works well when it arises. The Leiber/Spector classic “Spanish Harlem” is given a campy swing arrangement here, the whole thing bookended by what sounds like dialogue from a telenovella. Why not? The title track to Reunited is—sure enough—the Peaches & Herb tune, preceded by a short dramatic monologue that segues into a “spoken” verse that you won’t recognize at first. But as the chorus kicks in, there it is, harmonized but also set into a strangely wonderful arrangement that stumbles along like a robot tiptoeing through a junkyard. The tune is filled with sincerely crooned vocals and odd blurps and grunts. The horns play it sour and avant-garde, like pouring tart lime over a sweet dish. Fantastic. As fine as anything else on “Reunited” is a cover of Radiohead’s “The National Anthem” from Kid A. Unlike some of the brooding jazz versions of Radiohead tunes we’ve heard in the last ten years, this one has a funky swing to it, even as Sam Bardfeld brings haunting texture on violin and Ribot lays in the effects. The Passengers make it truly their own. Finally, Passenger fans will be happy to receive two live tracks featuring Deborah Harry. “Think of Me” is a sophisticated melody worthy of the Ellington band—seductive and smart at once. Then the band serves up a horn-driven version of Harry’s Blondie hit “One Way or Another”—everybody is having fun, with the rock song turned into jazz, no doubt, but the spirit of it all transcending style: the band blows some hot solos in the gaps, they harmonize with Harry on a late chorus, then it all turns into a glorious, fun rave-up tune. It’s great to see a group like The Jazz Passengers in 2010 as both a veteran survivor and as one of the year’s finest bands. The Passengers started as downtown pranksters, and maybe that’s still the gleam in their eyes. But the band’s longevity isn’t really built on shtick. These guys combine fun with invention, and the craft is utterly serious. They don’t take long indulgent solos but short, delicious ones. They play together like a tight rock band, but they blow beyond the obvious like only jazz players do. 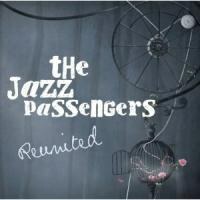 The Jazz Passengers—back in our hearts again.